Yesterday, the Congressional Budget Office (CBO) released its analysis of the American Health Care Act (AHCA)—legislation designed to “repeal and replace” the Affordable Care Act (ACA). The House of Representatives passed the AHCA earlier this month, in its second attempt at doing so , before the CBO released a score. The bill makes substantial changes to current law, which have large effects on both the costs of care and the coverage rates. I’m going to walk through some key provisions and their effects on specific populations, and compare these effects to those in the version of the AHCA that the CBO scored in March. The bottom line is that, if the AHCA becomes law, the number of uninsured Americans will grow by 23 million by the year 2026—just a bit lower than the 24 million more people who would have been uninsured under the original bill. This is the result of about 14 million fewer people on Medicaid, 6 million fewer with nongroup insurance coverage, and 3 million fewer with employer-sponsored health insurance; substantially fewer people will be on nongroup coverage under the House-passed bill than in the originally-score bill, while more will be covered by employers, likely because of provisions that make the nongroup market considerably less desirable. The total change in coverage from all these sources is shown in the figure below, copied in its entirety from Figure 2 in the CBO cost analysis. The share of each age group without coverage under current law is shown in the first bars of each set in dark blue, under the March 23 CBO score in the second set in the lightest blue, and under the legislation passed by the House is shown in the third set (mid-tone blue). The three sets of bars on the left show coverage rates for nonelderly adults below 200 percent of the federal poverty line (FPL), while the three sets of bars on the right show coverage rates for those above 200 percent of FPL. The width of the bars represents the relative size of the population, so you can see that adults between 19 and 29 years of age are more likely to be lower income, while those between 30 and 64 years of age are more likely to be higher income. In general, low-income adults are more likely to be uninsured under current law, but that difference is exacerbated under the proposed legislation. However, no group is spared. While low-income people face much higher rates of uninsurance, even significant shares of high-income young and middle-aged adults will be less likely to be covered. More than half of the loss in coverage, relative to current law, comes from 14 million fewer people on Medicaid. The legislation shifts the costs of the ACA Medicaid expansion to the states, by cutting the enhanced federal matching rate for newly-eligible enrollees from 90 percent of medical costs back down to the rate for other enrollees in the states, about 57 percent on average. Because there is a fair amount of churn among people eligible for Medicaid—since the population of Americans in poverty is not static—the share of the Medicaid population for whom the state receives the lower match rate will grow quickly, leading to a significant decrease in the federal match for Medicaid expansions. This, combined with new per capita caps in the program, will make it increasingly difficult for states to afford covering their residents and hence coverage will fall. In additional to the large losses in Medicaid coverage, 6 million fewer people will be in the nongroup market, and there will be compositional effects within that group as older Americans find the nongroup market increasingly unaffordable and younger people find it increasingly desirable. Meanwhile, by 2026, an additional 3 million fewer Americans will have employer-sponsored health insurance due to a combination of fewer employees taking it up and fewer employers offering it, as well as the AHCA’s repeal of the individual mandate, which incentivizes people to seek insurance coverage from employers if they can. Under the House-passed AHCA, fewer people leave employer plans because of the substantial changes in the nongroup market, which make it less desirable. The law increases economic vulnerability and health insecurity for millions of Americans by not only decreasing coverage rates, but also by disproportionately exposing those with low income to additional risk through the elimination of cost sharing subsidies in the nongroup market, forcing them to face higher out-of-pocket costs like higher deductibles and co-pays. Under the ACA, premium subsidies are available to people in the nongroup market on an income-based sliding scale, limiting the cost of purchasing health insurance. Additionally, cost-sharing subsidies are also available on an income-based sliding scale, which limits exposure to high out-of-pocket costs like deductibles and co-pays. Under the AHCA, there would be four major changes that affect Americans who want to buy insurance in the nongroup market. First, those cost-sharing subsidies are eliminated. Second, the premiums charged to older Americans can be up to 5 times greater than those charged to younger Americans, widening the maximum 3-to-1 ratio that exists under current law. Third, tax credits will be age-based rather than income-based for individuals with incomes below $75,000, at which point they begin phasing out to zero by $150,000 (the cutoffs for joint filers is $150,000). And, fourth—and here’s where the big change happened between the March CBO score and now—states can request waivers to limit what is considered an essential health benefit in their nongroup market. In response to those new definitions, insurers in those states would likely reduce the scope of benefits they offer. States can additionally request a waiver that effectively allows insurers to charge enrollees a premium based on their expected health costs, effectively removing community rating and discriminating against people for pre-existing conditions. Taken together, less healthy consumers in these states will likely see large increases in premiums and out of pocket costs. 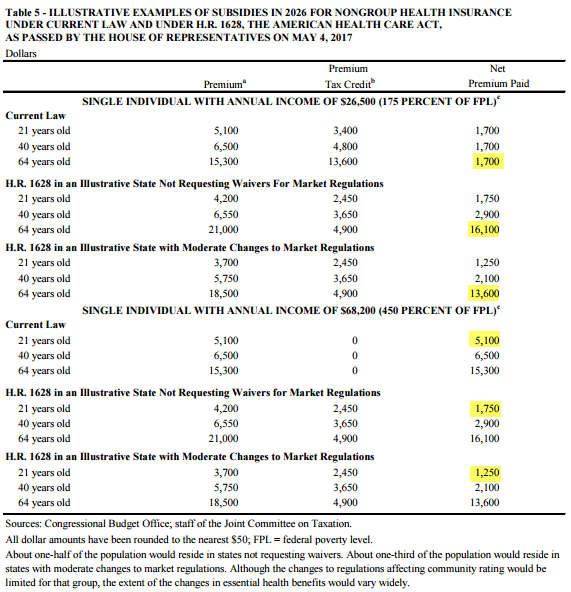 As with the earlier CBO score, some key highlights of the changes in the nongroup market are shown in Table 5, copied below. (For full notes on this table, see page 41 of the CBO cost analysis.) 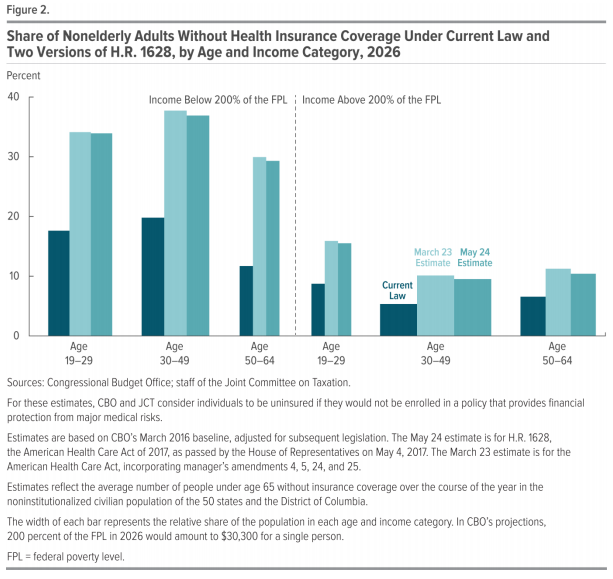 The table constructs comparisons of various age profiles in two income groups for individuals seeking coverage in the health insurance nongroup market in 2026. Premiums, tax credits, and net premiums for single individuals at age 21, age 40, and age 64 are constructed at income levels of $26,500 and $68,200 in the top and bottom panels, respectively. The combination of these changes have large effects on the premiums and out-of-pocket costs individuals pay in the nongroup market and when visiting doctors. Take the highlighted example in the top panel of a 64 year old with income of $26,200. Under current law, the gross premium (before subsidies) of $15,300 maxes out at three times the premium of the 21 year old ($5,100). But, given that that individual exposure to premiums is capped as a share of income, all age groups (with the same income) pay the same net premium of $1,700. This $1,700 pays for a plan that essentially provides generous coverage similar to what’s available to most people through employer-based insurance plans (specifically, it pays for a plan with an 87 percent actuarial value—a measure of the percentage of expected health care costs a specific health plan will cover for the population as a whole). Under the proposed legislation, that same 64-year-old with $26,200 in income (in states that did not change their market regulations) would now be required to pay $16,100—over half their income—on a plan with a far lower actuarial value (because of the elimination of the cost-sharing subsidies). This is considerably higher than the original AHCA estimate of $14,600. However, in states that changed their market regulations, by, for instance, eliminating maternity care and prescription drugs from their essential health benefits, their net premium would rise to $13,600, still more than half their income. Not only does this subject that person to far higher and arguably unaffordable premiums, but it also requires much higher cost-sharing when they seek medical care. And, for the subset of those states requesting both waivers, premiums can be far higher for those with pre-existing conditions. The research is pretty clear on what happens with increased cost sharing: it burdens patients who need care the most, leading some to reduce medically necessary (and sometimes cost-efficient) health care and others to risk their economic security. Unfortunately, the CBO does not provide the new actuarial value on these plans; however, it is clear that the share of health expenses that the insurer now covers has substantially gone down. Turning to the second panel, we can see a prototypical example of an individual who gains under the proposed legislation. The highlighted comparison is a 21 year old with income of $68,200. The first thing to note about this particular prototypical “winner” under the AHCA is how rare they will be: very few people in their early 20s make $68,000 annually. Under current law, their (unusually high) income—450 percent of the federal poverty level—is above the premium subsidy range, subjecting them to the entire gross premium of $5,100. Under the proposed legislation, their premiums would fall to between $3,700 and $4,200, depending on the state’s decision to change market regulations, because the AHCA allows a larger spread between premiums charged to old and young people. Also, under the AHCA this relatively affluent young person is eligible for a premium tax credit of $2,450, lowering their net premium paid to between $1,250 and $1,750, depending on their state. As this example illustrates, there is a clear cost shift from individuals who are young and high-income to individuals who are older and lower-income. And, regardless of income, because the new premium tax credit bands can only vary by as much as 2-to-1 for older versus younger enrollees, by design they disproportionately benefit the young (again, so long as they are affluent) in general. The additional cost-sharing requirements for older enrollees not only increase their financial and health risks, but CBO predicts it will lead to lower coverage in the nongroup market, particularly for older Americans. On net, the fall in Medicaid coverage and the shift in nongroup market premium subsidies, along with the elimination of the related cost sharing subsidies, lowers overall federal spending, predominantly adversely affecting lower income Americans. These cuts are to the tune of $834 billion for Medicaid and $276 billion for reducing the nongroup subsidies. On the flip side, the vast majority of budget savings are going to tax cuts that have nothing to do with the coverage provisions, essentially taking money that was spent covering millions of Americans and giving it to others in the form of tax cuts. These noncoverage provisions come to $664 billion over the ten year budget window. The proposed legislation goes one step further in increasing the regressivity of health and tax policy relative to current law. The AHCA eliminates the key progressive revenue sources currently used to finance the ACA’s subsidies and Medicaid expansions: the additional payroll tax of 0.9 percent on earned income in excess of $200,000 for individuals and $250,000 for families, as well as the extension of the 3.8 percent tax to high income earners’ investment income. Over the 10-year budget window, the Joint Committee on Taxation finds that these taxes’ repeal will cost $231 billion, not only clawing back a significant share of potential budgetary savings but providing all those benefits exclusively to very high income families. In the end, it’s clear that the coverage provisions of the AHCA disproportionately disadvantage the lower income while the tax benefits disproportionately benefits the higher income.